via spoon-tamago. Toto is Japan’s biggest toilet bowl making company… Now the company just released its first hybrid toilet-motorcycle that runs entirely on… poop. As the person drives, he can poop into a bowl, and that poop will be turned into fuel for the car. 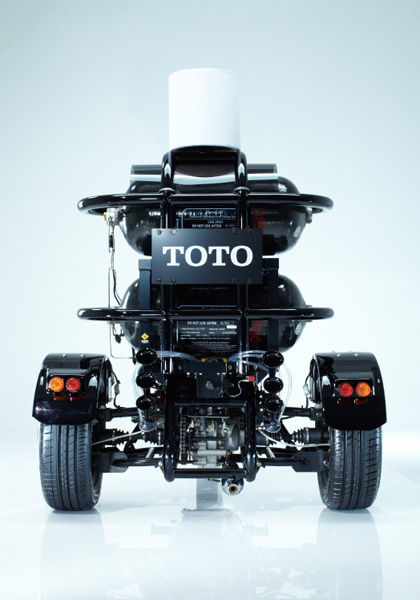 It is actually part of a campaign that Toto is running in an effort to reduce its CO2 emissions by 50% in the next 6 years. The motorcycle (and driver) will make its way from Kyushu to Tokyo over the next month. How ridiculous!? More photos below. The Kanagawa Institute of Technology in Japan recently unveiled this pregnancy simulator for men called the “Mommy Tummy” which simulates baby weight, allows the father to feel the baby kicking, rolling around in the womb, and gradually increases the size of the abdomen and breast regions over time to mimic the body changes experienced over a nine month period. The simulation lasts for approximately 2 minutes… Check out the video below. via mymodernmet. This is pretty cool! More photos after the break. 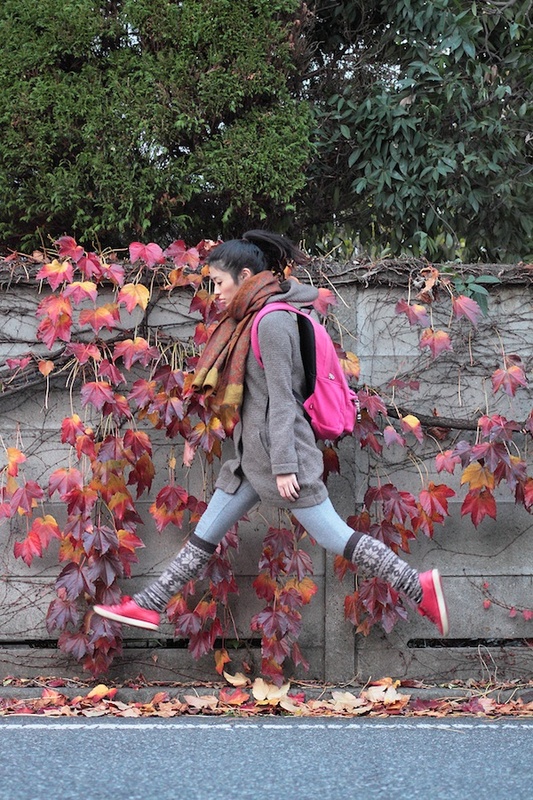 Natsumi Hayashi is a sweet-looking Japanese girl who, one day, decided to take self-portraits… of herself levitating. She can be spotted in and around Tokyo, equipped with her SLR and her self-timer. When she feels the moment strike, she presses the shutter button down and then, quite literally, “jumps” into place. What I love most about her shots is that they don’t feel forced. Natsumi has a way of making us feel as though she naturally levitates throughout life. via geekosystem. Lol… wtf? Thank you Japan. 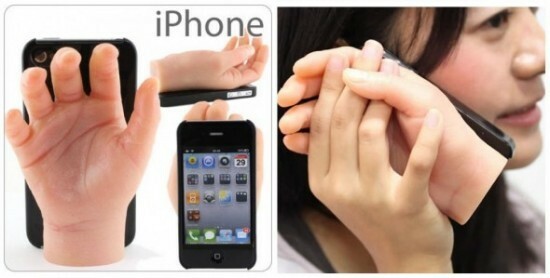 If you’re normal iPhone case is not exciting enough for you, why not buy one with a severed hand attached to it instead? Sounds completely reasonable. The Dokkiri Hand Case is available in two models, a Kid’s hand, and a Lady’s hand modeled off of the hand of the company’s COO. You can buy it here. via thetrendygirl. If you’re going to go wall climbing… might as well do it in style. This climbing wall was designed by Japanese studio Nendo for a Tokyo-based fitness club called Omotesando ILLOIHA. 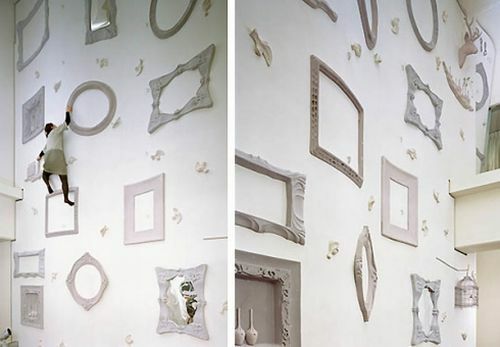 The wall has a mix of picture frames and climbing holds. Pretty cool! More photos below. 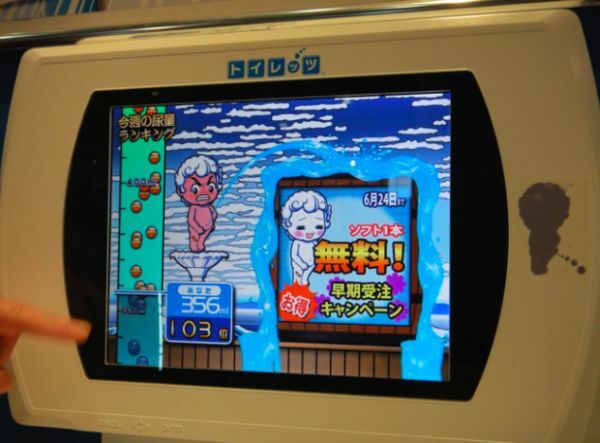 Haha… I did not take it seriously when I read about it a few months ago, but Sega is introducing a video game system called “Toylet” that will be playable in the urinal stalls of public bathrooms. The system will go on sale in Japan in November at a price of $1,850. The system has an infared sensor that sees the approach of a person and sets the screen to game ready display. Then microwaves hit the stream of **ahem** urine to detect its speed, volume, and duration, which is used as a controller for the game. Of course direction plays a part as well. Check out the video after the break. (may be NSFW if you consider a naked statue to be not safe for work). Japanese scientist Mitsuyuki Ikeda has come up with a way to create “fake” meat from sewage… apparently, his process involves taking the sewage, extracting the protein, adding a reaction enhancer, and putting it through an “exploder”. The “fake” meat or meat substitute is great for the environment and has less fat than regular meat, and is made up of 63% proteins (including the addition of soy protein), 25% carbohydrates, 9% minerals, and 3% lipids. Apparently the bacteria in the sewage is harmless because it is killed by heat during the manufacturing process… The only question is… would you really eat this crap (pun intended) knowing how it’s made? Gross… Video after the break. 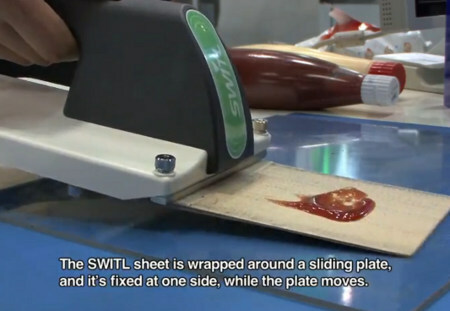 You may have seen my previous entry regarding the Japanese spill lifter called “SWITL”… Here is more footage of this product from Japan’s Food Machinery & Technology Exhibition… this thing is amazing! If you are a neat freak, definitely looks like it’s worth the purchase. Video after the jump. The SWITL sheet is wrapped around a sliding plate, and it’s fixed at one side while the plate moves, so items can be loaded and unloaded without altering relative positions. Currently, the sheet is made of Teflon. via NDTV. 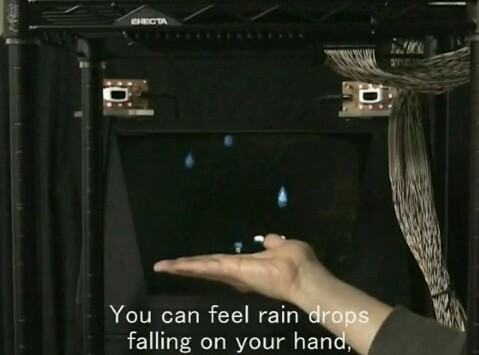 I’ve read a little bit about this before… but here’s a new report about researchers at Tokyo University that have succeeded in giving tactile sensation to holograms. The researches combined the holograms with ultrasonic waves to give a sense of touch to the user. Watch the video below. A video of a flying spherical reconnaissance drone developed by Japan’s military – the device makes for quite a spectacle. Video below. The unit officially goes under the prosaic name of “spherical flight vehicle,” having been developed as a prototype miniature drone.